The Wyoming Cowboys continue to show they have no quit under head coach Craig Bohl. That’s the number one thing I have been impressed with covering the football team since Craig Bohl put on the brown and gold headset. When you interact with players they are always positive and looking forward to the next opportunity. That is the culture Bohl has built and it was on full display against Air Force on Saturday afternoon as the Pokes won 35-27. In his Monday press conference, Bohl said that what we saw this weekend was part of the “bedrock resolve” of the program and that full credit goes to the men in the locker room and his assistant coaches. The Pokes had a disastrous first series on offense, both QB Sean Chambers and RB Nico Evans were injured. Chambers would leave the game on a cart and been seen later on the sidelines on crutches with a boot on his right leg. The news is Chambers broke his leg and will not play again this season. Bohl expects Chamber’s to have a complete recovery and since Chambers only played in 4 games this season he can be redshirted and will return in 2019 as a redshirt freshman with some experience. Nico Evans is day-to-day according to Bohl with some kind of ankle injury after being injured on one of the first few plays of the game against Air Force. He attempted to come back to the game but hobbled off the field after just one additional carry. Freshman RB Jevon Bigelow was also injured against the Falcons with what Bohl said was a rib injury but no status was given for him to play this Saturday against New Mexico. 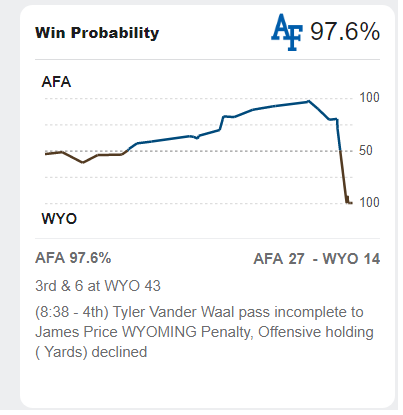 According to the ESPN win probability stat, when Wyoming threw an incomplete pass on 3rd down and 6 with on a drive that started with 8:38 left in the game, the Falcons had a 97.6% chance to beat the Cowboys. That did not phase the Pokes though, as on 4th down Air Force would commit a pass interference that would keep the drive alive. That drive would be capped by a Tyler Vander Waal 5-yard TD run to make the score 27-21 Air Force. Wyoming would later convert on another key 4th down en route to the eventual game-winning score when Vander Waal found Austin Conway on a 22-yard pass with 1:09 left in the game. I would say winning a game when at one point you only had a 2.4% chance to win according to the stat geeks is quite improbable and this is why we love watching live sports. A lot of credit has to be given to QB Tyler Vander Waal. To come into the situation he did after being benched three weeks ago and to produce in a big-time way is quite amazing. Perhaps being able to see the last few games from the sideline gave him a new perspective on things and he by far had his best game as a Wyoming QB (with four total touchdowns). He looked like a different player out there playing with confidence which was quite different than the last time we some him play against Utah State where he threw an interception on a screen pass. Like many of you, I thought the game was as good as lost when Chamber’s left the game with his injury and I was happy to see Tyler Vander Waal fight for his senior teammates on Senior Day to make sure they left the War as winners. The Pokes now need one win against a not so good New Mexico team (3-8 on the season) to have a chance at going to a bowl game three seasons in a row. Going to three consecutive bowl games would be quite the feat as Wyoming has never accomplished that feat in the history of the football program. The New Mexico game is on the road though and it won’t be an easy place to get a win. Plus, there is the fact that if Wyoming wins, the Mountain West would have seven bowl-eligible schools with only five spots specifically earmarked for the conference. So don’t make those bowl plans just yet.